When I first saw the product release for the Tamrac Evolution camera bag, I knew that I had to get it! It is so ridiculously innovative that I am surprised no one thought of it before! First, this camera bag is a true convertible – switching between a backpack and a sling just by changing the connectors. Anyone with a neck or shoulder problem, take note – it can even convert from a left-sided sling to a right-sided sling! The extra straps tuck-away when worn as a sling, so you could even convert it to a full backpack at any time. Second, the deep main compartment can be accessed on three-sides – left side, center and right side. Each access point is wide enough to pull-out a full SLR with grip and lens attached. The larger Evolution 8 will even allow a 8-inch lens to be stored on camera with grip! (That includes a long lens like the Canon 70-200mm f/2.8 IS L and Canon 100-400mm L!) Put the camera on one side and spare lenses on the other. However, you want it! Third, the top compartment is fully padded and big enough to care another camera body. Or, store the items for your day-trip and lunch. Since the floor is just more velcro inserts, you can even remove it to gain a fourth access point to the main compartment spanning the full 18.5-inches! Fourth, every zipper compartment has pockets to store flash cards, filters, lens caps and other accessories. Fifth, the bigger Evolution 8 has a narrow fully-padded pocket down the back of the pack which is perfect for a netbook or 15-inch laptop. Magazines, maps other other flat items will fit too. Sixth, it includes a waterproof raincover in one of those many pockets. The Tamrac Evolution has been featured in every photo magazine this month and Tamrac just started shipping them to stores. Adorama just received their first shipment and have all four models in stock! The larger Evolution 8 is available in black or tan/brown. The smaller Evolution 6 is available in black or tan/brown. 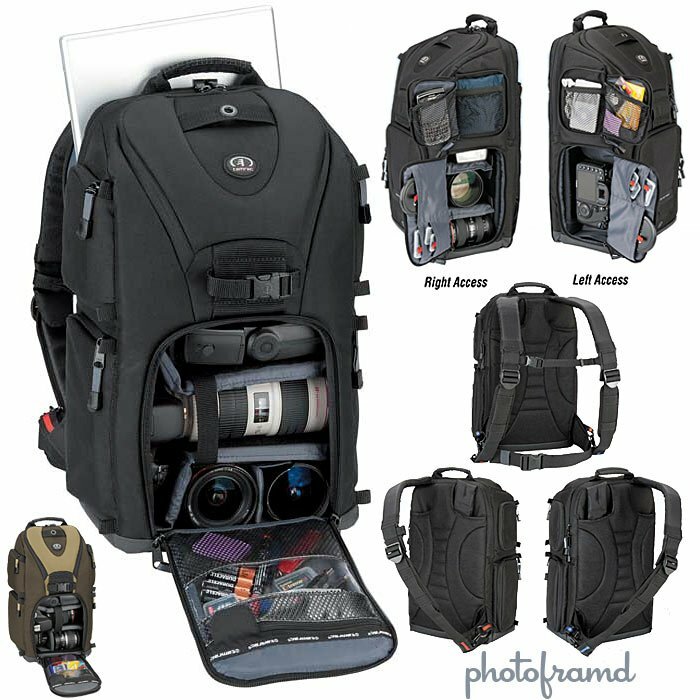 Excellent concept in camera/laptop gear pack! Need to make a model large enough for the newer 18″ + laptops though. Many are moving up to this class of laptop. Other wise it is the bag to have for photography on the fly. In my case I use an HP DV7 which is a bit too big for the Evolution. It’s a great camera bag, but fitting an 18″ laptop is a stretch. Do you really need to lug that around while you are taking pictures? Netbooks and tablets are perfect for field use. Links to Adorama are not working. Thanks for pointing it out. The article was published during the summer and Adorama updated their site since them. All of these links have been updated.